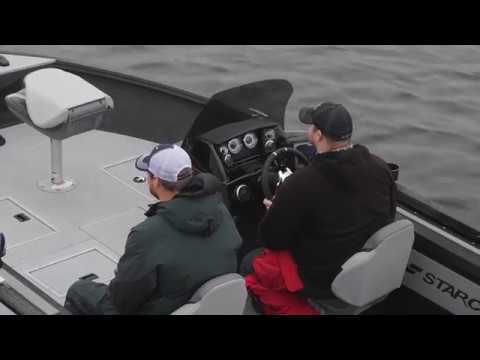 The Starcraft Renegade 178 SC is the ultimate in fishing boat value. Featuring new stunning designs and colors from Starcraft, this rig is sure to turn some heads. Equipped with standard bow and stern livewells, in-floor rod storage, and deluxe moveable fishing seats, you'll be fishing in style and with all the amenities you need for a great day out on the water. Mercury 115 Pro XS four stroke, MinnKota Terrova 24V 80lb thrust with Ipilot/link and quick release, 2 bank on board charger, Helix 7 DI/GPS w/ram mount, tilt steering, gunwale track system with four rod holders, flip up/down rear bench seat and trailerable ratchet cover. Custom bunk trailer with load guides, spare tire and swing tongue. Circuit breakers, fuel gauge, volt meter, speedometer, tachometer, Bluetooth stereo w/ 2 speakers. Limited Lifetime warranty, twice baked urethane paint, double riveted chine & transom seams, Lifetime Warranty on all double riveted seams. Aerated stern livewell, aerated bow livewell. Center rod storage, in floor storage, starboard bow storage, port and starboard gunwale storage.